A chrysalis (Latin chrysallis, from Greek χρυσαλλίς = chrysallís, pl: chrysalids) or nympha is the pupal stage of butterflies. The term is derived from the metallic gold-colouration found in the pupae of many butterflies referred to by the Greek term χρυσός (chrysós) for gold. 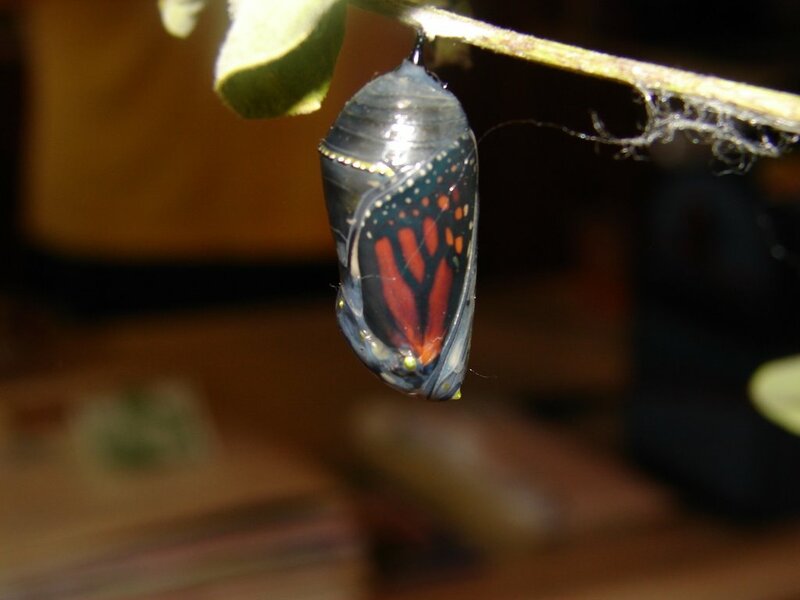 The chrysalis stage in most butterflies is one in which there is little movement. However, some butterfly pupae are capable of moving the abdominal segments to produce sounds or to scare away potential predators. Within the chrysalis, growth and differentiation occur. The adult butterfly emerges from this and expands its wings by pumping blood into veins. This sudden and rapid change is termed the metamorphosis and in this particular case is called complete metamorphosis (see also holometabolism and hemimetabolism). With moths, sometimes the chrysalis is itself contained in a protective silk case called a cocoon. An old term synonymous with chrysalids is aurelia from which is derived the term aurelian for one who studies the emergence of butterflies from chrysalids. Our granddaughter Victoria (14) took this picture showing the final stage of this change. By the looks of things, the butterfly is about to spread its wings and shout, "Look at me now! Remember that ugly caterpillar? I'm a new creation now!" design"? I know that there is and I know the Designer personally through faith in His Son, Jesus Christ. He's the Creator God and He does incredible things. Hallelujah! Note: Shortly after posting this, the butterfly burst out of its chrysalis. Fortunately Carol saw the chrysalis begin to break apart and we watched in awe as the butterfly made its grand entrance into the outside world. After letting its wings dry for about an hour, we took it outside. We will post more pictures when BLOGGER quits acting up. We have one of Matthew holding the butterfly about 6 hours after it broke free. Victoria is a good photographer! !